The EGO Power Chainsaw truly delivers power beyond belief. The 14-inch bar and chain, combined with a high-efficiency brushless motor, provide smooth cuts. The brushless motor extends the life of the tool and the run time. The EGO POWER+ Chainsaw delivers the performance of gas without the noise, fuss and fumes. 14-inch 56V Li-Ion Cordless Chainsaw (Tool Only) The EGO Power Chainsaw truly delivers power beyond belief. The 14-inch bar and chain, combined with a high-efficiency brushless motor, provide smooth cuts. The brushless motor extends the life of the tool and the run time. 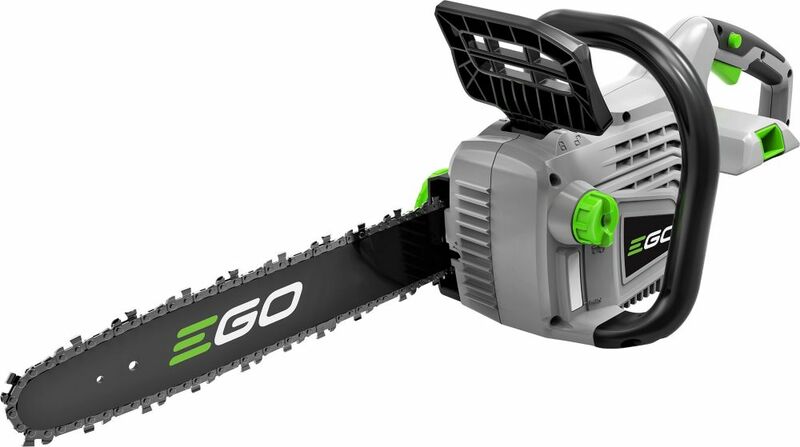 The EGO POWER+ Chainsaw delivers the performance of gas without the noise, fuss and fumes. 14-inch 56V Li-Ion Cordless Chainsaw (Tool Only) is rated 4.8 out of 5 by 445. Rated 5 out of 5 by Danny56 from Ego 14” chainsaw (March 2019) Excellent power to weight ration. It cuts very smoothly. I’ve used Stihl, McCullough and Oregon. This saw cuts as well as a gas saw. Make sure you use bar and chain saw oil. It is very sensitive to the oil’s tackiness to the chain and bar. The first wood I’ve used it on is mesquite, which is quite hard wood. Rated 3 out of 5 by Tom603 from Low torque I am a little disappointed with the power in this chainsaw. I purchased a refurbished saw, and I can't help but wonder if this is the reason it was returned to begin with. The saw will cut under light load, but stalls easily when pushed a little harder. I have used chainsaws for about 40 years, so I have a fair amount of experience, and when my 14" gas saw died, I decided to replace it with the cordless. I do like the fact that with the pull of the trigger it starts (or restarts), and I definitely appreciate the lighter weight, so I will continue to use it. I just wish it had a little more torque! Rated 5 out of 5 by dgldseq from Great little saw! Plenty of power to cut 4" to 5" inch logs. I was surprised that the 2.5 battery lasted longer than I expected. I do have another battery and had it ready to go. But, I didn't need it. The only problem I had was getting used to how tight the chain should be. I threw it 6 or 7 times before I got it right. But after that, away I went. Rated 5 out of 5 by MarkAr from Great battery life Cuts like a gas chainsaw. Used 5Ah battery from Backpack Blower and it lasted for hours. Chain stayed sharp. Didn’t start one time until I realized the kickback break needed to be reset. Very satisfied with EGO products. Finished with noise, fumes, exhaust, and hard starts. Rated 5 out of 5 by Otis923 from EGO 14” electric saw I used this saw to clear trees and branches after a winter storm. The saw cuts through green oak with no difficulties. The battery lasts 25-30 minutes and it’s performance drops a little after the battery power gets low. The saw is light and easy to use. Great saw for around the house chores. Is the 14&quot; saw the same as the 16&quot; saw except for a shorter bar and perhaps some user-replacable parts? If the 16&quot; is stronger, can any shorter bars be attached to it to use the saw for other cutting applications? Hi Curious, please contact the Ego team to compare the differences: 855-346-5656. Thank you for your question. is it come with the battery or not? if not, what's the price for the battery and where to purchase it?